Marisol goes after her dream and auditions for Premiere, the exclusive performing arts H.S. She'ss accepted into the dance program. On Marisol's first day she meets Drew, a drama student. The chapters alternate between Marisol and Drew. Both characters are very likeable. The author does a good job of balancing the story from the two view points. I was pulled in by the great back stories of the characters. Going to Premiere for Marisol, means not going to school with her best friends for the first time. She also must commute from Brooklyn to Manhattan. Drew gave up being a basketball star to pursue acting. There's a bit more behind both stories, making it very easy to care about them. Drew was my favorite. Thanks to basketball, Drew was very popular at his old school and he gave it all up for to try his hand at acting. 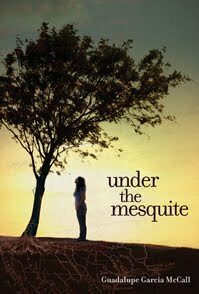 I really liked the idea that Mckayhan might be making drama as respected as a sport to some readers who may have dismissed it in the past. Marisol and Drew's stories mesh well together, as do their friends. Ambitious is a good story with the right amount of drama making for a great page turner. This is the first book in this series and I am looking forward to watching the characters grow. Looking back on Ambitious I realized many of the problems I had with novel had more to do with editing. On page 11, Marisol references Premiere or Premiere High School, five times. It happened again on the next page. It was turning into a bad drinking game, I came very close to putting the book down. Thankfully this over use toned done some. Marisol is Mexican and on occasion she would speak Spanish to family and friends. Hola, Mari, Coma esta? Luz's mom asked how I was doing as she opened the back door and let the smoke out. "Estoy, bien" I told her I was okay. A pet peeve of mine is an instant translation of a foreign language, especially when its a greeting. The context of the conversation is more enough for a non Spanish speaker to get the gist of what is being said. Also I am pretty sure that "estoy" would never be used outside of the classroom. If any of these issues were caught, Ambitious could've been that much stronger. Since I want to end on a positive note, I'll take a moment to point out the great cover. It tells the reader exactly what the story is about and I think dance fans will love it. This is a beautiful portrayal of Romare Bearden's childhood journey. Showing many of Bearden's early influences from his birth state of North Carolina, his grandparents and trains. Harvey uses a lyrical bluesy text very fitting of Bearden's artistic style. As a young boy Bearden migrates from the south to the north. The story centers around this life changing move. I loved this biography, which is filled with heart and rhythm. Once I read the source notes and discovered that Harvey was influenced by several of Bearden's quotes it made this look at Bearden's childhood journey that much more authentic for me. 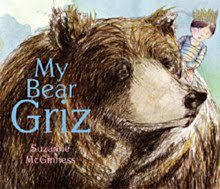 This is Elizabeth Zunon's first picture book. I am already a fan. The collage illustrations are a beautiful tribute to Bearden's style. Zunon manages to stay true to Bearden and incorporate much of her own style as well. I love her color palate. Check out some of Zunon's illustrations. The top six are from My Hands Sing the Blues. Harvey and Zunon have come together to create a fabulous introduction to one of America's greatest artist. My Hands Sing the Blues will be released in September. Bearden was born on Sept 2, 1911. 2011 marks 100th year of his legacy. 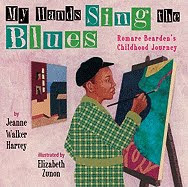 Reading My Hands Sing the Blues made me want to revisit Bearden's work. Which I was able to do here a Centennial Tribute site in his honor. Lupe moves from Mexico to United States to live with family. Lupe will be in the same grade, (fifth) as her cousin Margarita who goes by Margie. The story alternates between the cousins. Margie does everything she can to fit in and not be teased for being Mexican. Lupe is trying very hard to learn English and adjust to life in the United States. Lupe and Margie's voices blend very well together making for smooth transitions. At one point Margie is reading How Tia Lola Came to (Visit) Stay for class, which I thought was a very sweet nod to Julia Alvarez. I loved the beginning it says so much as to why Margie does everything she can to distance herself from her Mexican roots. "Margie felt nervous having to wait outside the principal's office. She kept her eyes fixed on the huge map that covered the entire wall. Mrs. Donaldson seemed to be a plesant woman, but Margie had never had to address the principal all by herself before. The map's colors were vivid and bold showing Canada, the United States, and part of Mexico. Alaska and the rest of the United States were a strong green; Canada was a bright yellow. The reminder of the map, however, showed only a small part of Mexico in a drab sandlike color Margie could not name. " The author created two realistic characters in Lupe and Margie. They both made Dancing Home a very nice story and a pleasure to read. It's Halloween, Danny and his best friend Wendell are going trick or treating. Wendell' mom, who can't sew and loves educational things, made his costume. Danny isn't happy to find out Christiana, a girl from their class will be going with them. When Danny's dad their chaperon has his back turned Big Eddy challenges the three to go into a haunted house. Once inside all the exits are locked and they can't get out. Thanks to previous adventures Danny and Wendell need little convincing about the existence of ghosts. Christiana refuses to believe in ghosts without any evidence. To leave the house the three must first explore it. In the process they run into a very creepy clown. This is the fifth Dragonbreath book. Danny and Wendell still have the same wonderful friendship chemistry. Christiana's straightforward practical sensibilities play off of the two very well especially Wendell. I love this series and always look forward to the next adventure. 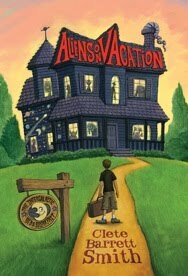 A great recommendation for Wimpy Kid fans. On a very hot day Michael takes the bus to town with his Grandma. Halfway there all Michael can think about is getting a cool drink from the water fountain. He only takes a few sips of the nasty tasting water. Next to Micheal is a boy his age taking a nice long drink from the Whites only fountain. Now Micheal wants to see for himself how refreshing and cool the White water taste . I was very surprised by how much I enjoyed White Water. Many times historical picture books are so focused on teaching, there's little room for anything else. White Water is the best of both worlds. From the seating on the bus to the two water fountains its a good look at the segregated South. With Micheal's imagination from his army men who cover him to daydreaming in class, the story is also fun. Strickland's wonderful illustrations compliment the text beautifully. The spreads are open with very nice muted earth tones. I love Strickland's commitment to detail, from the water drops to Micheal's faithful dog. The illustrations confirm that this is a story about a boy who went on a dangerous adventure and learned a valuable lesson in the process. Textually and visually White Water simply came together very well. Sugar! My voice is strong, smooth, and sweet. I will make you feel like dancing. Close your eyes and listen. My voice feels like feet skipping on cool wet sand, like running under a waterfall, like rolling down a hill. My climbs and rocks and dips and flips with the sounds of congas beating and trumpets blaring. Boom boom boom! beat the congas. Shake shake shake! go the hips. 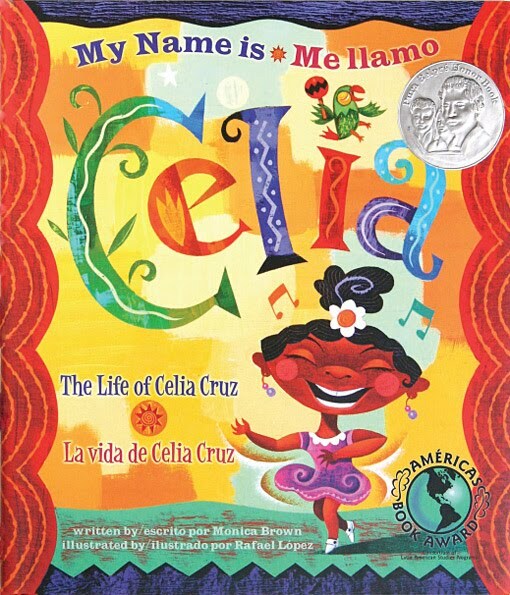 Released in 2004 it was an Americas Book Award winner and recieved a Pura Belpre honor for illustrations. This year Rafael Lopez released postal stamps featuring Latin American music legends. Five in all incuding Celia Cruz. They are gorgeous. David, who goes by Scrub, is not happy about having to spend the summer with his grandmother. She lives in a secluded part on Washington and runs a bed and breakfast. All of the guest are a little strange to Scrub and he thinks its because they are really into their love of space. Eventually the grandmother tells Scrub she runs a bed and breakfast for aliens . Scrub starts helping around the B&B. His grandmother has kept her guest a secret from the town for over twenty years. After Scrub makes a bad decision the truth about the Bed and Breakfast could be discovered. I only picked this up because the author is going to be at the Decatur Book Festival this year. After reading the first page, I knew had winner. "When the taxi pulled up to Grandma's place, I wanted to burrow under the seat and cower in shame. I blinked a few times, but the view didn't get any better. Of all the place my parents had dumped me for a summer, this was the dumpiest. The sign out front said it all: The Intergalactic Bed and Breakfast. The three story Victorian home had at least the potential to be normal, with its white picket fence and rocking chairs on the wraparound porch but no. The house was jet black with huge murals of comets and stars and planets on each side, painted on with what looked like glittery nail polish." Billy and Griz go on a lot of fun adventures. When I was working at a bookstore, I always had a difficult time finding picture books to recommend for young listeners between 1 -3yrs old. My Bear Griz is perfect for this age group. The text is short and the font is large - "We like to go exploring" or "Griz is a great listener. We like to share secret"
"We like to go exploring" is the only text on one page. -"Griz is a great listener. We like to share secrets", its the only time two sentences are on one page. Not combining the short text makes this story that much for ideal for young listeners. The text and illustrations blend together very well. Griz takes of the whole page in almost every spread adding to the wow factor. Griz looks as adorable as his name. McGinness use of color is great, I especially enjoyed the crayola inspired trees. I love this very sweet story that encourages imagination. The surprise ending is great. Ashline and her older sister Eve are adopted. When Eve left, Ashline was the only Polynesian student in are almost all White school. After an incident on a roof, Ashline is forced to go to private school in another state to start over. Ashline's new life is interrupted when she's one of only five people to hear a girl scream for help. The five soon learn they are gods and goddesses who are always reborn as human. There's a war coming, Eve comes back forcing the five to pick a side. The story moves at a great pace. I really liked the characters and their relationships. The five have good chemistry with the right amount of tension. The dialogue is as sharp as the action. This was some serious page turning fun. Loved it and the diverse cast. Knight started with a strong foundation for this series. A favorite debut of 2011. Aston loves his grandads and the music they play. Grandad Harry from England plays the trumpet. Grandad Roy from Trinidad plays the steel drums. Aston's spends a lot of time with them learning how to play each instrument. On first glance I thought this text heavy story would be better as an early reader . 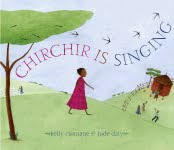 Though once I read it I loved the fullness of a picture book for this story. When the band that was suppose to play at Aston's school cancels, he turns to his grandads for help. This is a very fun story, on almost every page Aston and his grandads are smiling. The parents are in a few spreads as well. Benjamin does an excellent job of making this feel like a family. Chamberlain's beautiful, open, light, and expressive illustrations compliment the text very well. 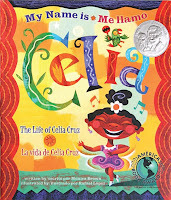 It's difficult to find picture books that feature a biracial character. So it was very nice to discover My Two Grandads. I absolutely love that the story is never about identity. It's all about Ashton's love of his grandads and music. Ashton is simply Ashton. The fact that this picture book is from across the pond, and includes lines like - Can I have a go? or Well, you're a big lad now, so I think you'll have enough puff ", make it that much cooler. 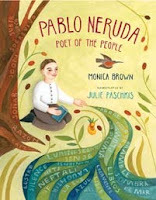 Beginning when Neruda was just a little boy with the given name Neftali. It shows the poet at different stages in his life in such a beautiful way that it's easy to get lost in his world. Brown's text has a rhythm that would make any poet proud. "Pablo loved the stones of Chile. He wrote about stones by waves onto the beach and stones polished by sand and salt." Paschkis beautiful illustrations pop and adding more life to the story. I am a fan of Brown and Paschkis, so I was very happy to see how well their styles blend. Words in English and Spanish are sprinkled within the art. It's a goregous collaboration between artist and illustrator. If there was greater back matter I would've loved this biography even more. An author's note and resources are included. Anjali loves cooking and works in her families Trinidadian restaurant. Anjali cooks with her grandmother. On Saturday the two attend a cooking class run by chef Nyla. Anjali loves the classes where she's able to learn about different cuisines. Anjali dreams of being a Food Network star. Her parents think cooking is simply a hobby. Chef Nyla tells Anjali about a new Food Network contest, Super Chef Kids. Anjali enters without telling anyone. Only when Anjali is chosen as a finalist does she tell her family about the contest. Her parents are excited until they discover that the competition will conflict with a H.S entrance exam. Anjali defies her parents, continuing on with the contest. When the truth is discovered her parents are disappointed and angry. Though they soon support their daughter, who has a very good chance at being the first Super Chef Kid. The author is a trained chef and food writer, it shows in her main character. Anjali does an excellent job in talking about and describing food. It's easy to see Anjali passion and love of cooking. Away from food the story doesn't feel as natural. I do like Anjali's relationship with her grandmother and best friend Linc. Out of all the secondary characters those two are the best develop. Though overall there wasn't much depths in the characters. The story was okay, the food shines throughout. This would be a good suggestion for anyone who enjoys being in the kitchen. The best thing about Stir It Up are the recipes. The book is worth buying for the 14 recipes alone. Ganeshram gives step by step instructions on how to cook each one. Everything sounded delicious. Two of my favorite, the coconut dark chocolate chip cookies and the shrimp burger pitas. Peter and his best friend Drew were popular in elementary school. A day into middle school, the two realize they are no longer cool. Peter and Drew don't know how their status changed over the summer. Peter comes up with several plans to make them popular again. 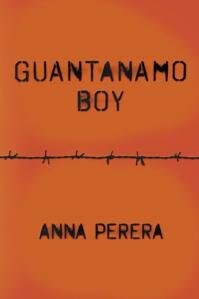 All the schemes fail, until Peter figures out detention is the key to popularity. Soon Peter and Drew's friendship is strained by starting middle school and losing their cool status. Peter's older sistery Sunny gets perfect grades and wins everything. So Peter has the added pressure of trying to keep up with his teachers expectations. I wasn't a big Peter fan but his voice was believable. I thought the author did a good job with Peter and Drew's friendship. They had a great back n forth, it was easy to imagine that they've been friends for years. This was an enjoyable read with some funny moments. A few of Peter's interactions with his parents had me laughing out loud. This is Yoo's third novel and middle grade debut. It's a solid debut, it's not always easy to make that transition from a YA voice. Yoo does a good job, Peter and Drew feel very much like the middle school freshman they are suppose to be. Their fear of middle school and not fitting in play out well. This was one sequel I was really looking forward to reading. 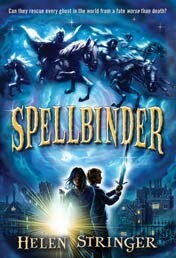 I loved the first book, Spellbinder. Set two months later, Belladonna and Steve have gone back to their normal routines. Belladonna is still the quiet girl with no friends and Steve continues not to pay attention in class. Belladonna lives with her ghost parents. On paper she resides with her grandmother. It works well until some informs the authorities Belladonna is living alone and her grandmother goes missing. After a field trip to a Fenchurch Abbey, Belladonna and Steve realize their talents are needed again. Belladonna caretakers, The Proctors seem nice but Belladonna soon wonders how much she can trust them. Forcing Belladonna to keep the mission a secret. It's nice to watch Belladonna and Steve grow into their roles. Belladonna is the spellbinder and Steve her protector.The elements I enjoyed in the first book are present again. Belladonna, Steve and the ghost Elsie still have good chemistry, making for some great dialogue. This is a wonderful sequel and best enjoyed in order. So I highly recommend reading Spellbinder first. As an added bouns chapter one of Spellbinder. I loved the hardcover edition. The new paperback edition is nice as well, and I think it will attract a larger audience. 12 yr old Cole lives with is mother in Detroit. When Cole's mom finds out he's been ditching school for weeks, she's had enough. She drives the two of them straight to Philly, and leaves Cole with a father he's never meant. Cole's father Harper runs a stable in the city. Cole doesn't know what to think of his father or the horses. He's quickly put to work and learns a few things from the Black cowboys he never knew existed. The stable has a long history with the community. Between those blocks there's no gang violence. Now the city is demanding the land back. After learning from his father and the other men, Cole steps up to help out the Cowboy Way. Cole's voice was very strong. He took hold of the story from the very beginning. And he has one of the best lines of the year. "I look in the closet and see he pulled some stuff out of it and put a blanket on the floor. Uh no, I ain't no Harry Potter. And I ain't living in no closet." One of the things I love about Neri, he knows how to tell a good story. Ghetto Cowboy moves at a great pace and everything fits together very well. I loved Watson's illustrations, they added a nice dimension to the story. Neela brings her instrument, a veena to her sixth grade class for the around the world unit. On the way home there's a very bad rainstorm. Neela is offered shelter from the rain by an old man in a church. She's very uneasy about not being able to take her valuable veena straight home. Also the old man is a little strange. The two have an odd conversation in the kitchen. When Neela goes to leave her veena is missing and the man has disappeared. The veena is very special and rare it was a gift from Neela's grandmother in India. Neela is determined to find her instrument even after her parents tell her to stop. 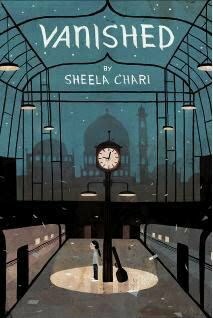 I enjoyed Vanished a lot and loved Neela's voice. It was also nice to see Neela's parents and younger brother, Seri were a part in the story. "Like strep throat or the chicken pox, or the Great Plague which Neela read about in social studies, bad luck was one of those things are one of those things are mother tried at great length to avoid. She was training to be a pharmacist, and it was her belief that all human experience was the result of chemistry and luck, good and bad. But mostly bad. Neela's father would always exclaim that's so unscientific. But there was no changing her mother's opinion. Bad luck was an impenetrable force working against them all. Worst of all it was contagious." Since the suspect list is small, I liked that the other doesn't throw in too many red herrings. The mystery lies more in the how and why the veena was stolen. The story moves along at a great clip. There's a nice hint of creepy and unexplained darkness. The age old curse on the missing veena adds to this feeling. Neela slowly connects the clues and everything comes together in India. Neela reminded me of Glida Joyce. Both characters have a certain similar quailty that I love. Vanished was a well layered story that was simply a lot of fun. An excellent debut and one of my favorites of the year. I hope this is the first of many books starring Neela Krishnan. This is a biography about Joesph Boulogne a not so well known classical artist. Joesph was born in 1739, his mother was a slave and his father a plantation owner. He was exposed to music at an early age and given violin lessons. When Joesph was nine the three moved to Paris where slavery was banned. Once in Paris, Joesph's father gave him the title, Chevalier de Saint George. To get along in Paris society a title was necessary. I loved that the chapters were called movements. A favorite fact learned. "On his twenty -first birthday, Joesph was given a beautiful and costly violin, made by Nicolo Amati, teacher of the world famous violin maker Stradivari"
Ransome's illustrations have an elegant and sophisticated feel, fitting the text perfectly. This is a very good introduction to Joseph Boulogne, Chevalier de Saint George. With non fiction picture books I believe a time line is essential, especially if the subject is not well known. There is no timeline, though the author does include an author's note. Sometimes comparing books can't be helped. 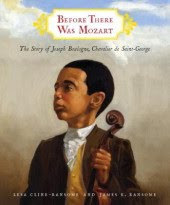 While reading this I found myself thinking about the other biography on Joesph Boulogne, "The Other Mozart" by Hugh Brewster. I couldn't stop thinking about it, so I checked out The Other Mozart from the library to see how they matched up. The two compliment each other very well. Before There Was Mozart is targeting a younger audience. I could easily see someone, reading Ransome's first, then moving onto the Brewster's for more on Joseph Boulogne life. I've linked this post to Non Fiction Monday. This weeks round up can be found at Apples with Many Seeds. 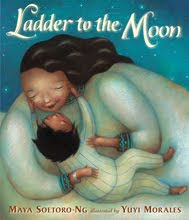 One night a ladder comes down from the moon, Suhaila gets to meet her grandmother Annie. They go up together and have an adventure. From a top the moon grandmother and granddaughter watch the world and help when they can. This is a beautiful story about two generations meeting and people coming together. "Looking past the golden ladder, she spotted people whose hands pointed upward from a synagogue, a temple, a mosque, and a steepled church. One by one, every person was finding his or her own path to the moon each path connecting with the others in hope's massive stream. " This is simply gorgeous on all levels. I love magical feel and the lyrical flow of the text. The message of unity is naturally intertwined. Morales illus. are some serious WOW filled with warmth. They made me smile and believe in a better world. My favorite spread changed each time I turned the page. Soetoro-NG and Morales styles blended very well together. A 2011 favorite. Louis Daniel and his parents must quickly leave the house after the levee breaks. The family makes their way to the Superdome. The only thing Louis takes his is trumpet. 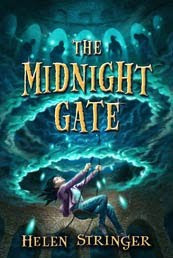 Readers see the storm through the eyes of 10 yr old Louis and the author does an excellent job of capturing his voice. Much of the story takes place at the Superdome. After the family gets separated, Louis knows just what to do to find his father. This is a wonderful story about hurricane Katrina. Rather then shy away from the harsh realities of the storm, Uhlberg uses a soft hand to describe what happened. At the center of the story is the family, Bootman's art highlights this point. The illustrations are good and complement the story. The only thing I'd change about is the unimaginative title. Though once I started reading I forget all about it. This would pair well with A Place Where Hurricanes Happen by Renee Watson. Both stories are about Katrina but are very different. Carlos has been a make up artist in training since he was 12. Now 16 Carlos gets his dream job, working at Feature Face cosmetic counter at Macy's. He believes working at Feature Face is the first step to being discovered. Carlos boss doesn't like him and the new job cost him a very close friend. This story is about a young man that knows what he wants and is going after it. Carlo's personality is as loud as the cover is bright. Behind his big personality, Carlos loves his mother and older sister, Rosalia. He isn't hassled at school but Rosalia boyfriend and friends always have snide comments. Carlos does his best to ignore them, putting all his energy into becoming famous. When Carlos big break comes saying yes means risking everything. After three chapters I was very close to putting this one down. I didn't like the way Carlos interacted with his friend Angie or felt the need to comment on what she was eating. When this stopped, I was able to focus on Carlos again and he grew on me. I am glad I kept reading, I discovered there was more to Carlos then his fabulous style. There were a few story lines going on at once, from the mother losing her job, to Rosalia abusive relationship, and Carlos crush. They all blended together making for a very well rounded story. New Releases for the month of August with characters of color or a diverse cast.